In 2012, official reports stated that the water taxis carried about 500,000 passengers – and the number of passengers is set to increase. Every morning the roads are gridlocked and drivers are forced to wait in traffic. St. Petersburg's former governor, Valentina Matviyenko, proposed to deploy water taxis to alleviate the congestion. 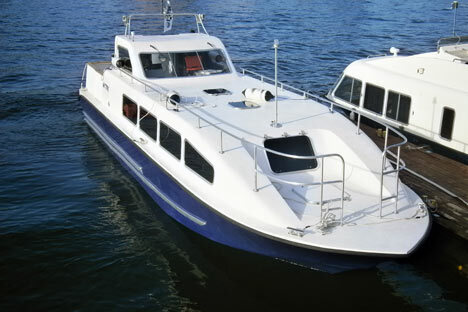 Commuter boats transport passengers via waterways, seating a maximum of twelve. Many of the city's residents complained that they filled up too quickly. In stepped Inter Yacht Service. The company operates two of the four lines in St. Petersburg. It holds a total of sixteen 12-seat boats and four 36-seat boats (bought for €500,000 or $750,000 each), which were introduced this year. Inter Yacht Service director, Sergei Cherepanov, says the new investments are worth the risk and will amortise in five years. Talking with him, you realise how frustrated he is with the city council. When Matviyenko was in office, seven additional water taxi lines were being planned. But, her successor, Georgy Poltavchenko, is halting the expansion plans. The city-subsidised water taxis have become unprofitable in recent autumn months. Last year a ride cost 100 roubles, (€2 or $3), which made water taxis popular among tourists during the summer. “Tourists see them as an inexpensive alternative to the pricey boat tours, but in reality they are there to transport city residents,” says Cherepanov. It takes between 30 and 45 minutes to travel one line from start to finish, while the same route by land could take twice as long. Water routes make it easier to go from one St. Petersburg island to another, but in bad weather, such as heavy rain or fog, the boats remain docked. Without reliable statistics it's uncertain whether water taxis are alleviating St. Peterburg's congestion. Cherepanov is optimistic, “to have any tangible effect, the lines have to be expanded and the water taxis have to run more frequently." Info: Water taxis operate from May 31 until October 31 and run every 15 minutes during the hours of 8:00 a.m. to 8:00 p.m. The routes can be viewed here.